2017 Video Montage of the Olympia Rafah Solidarity Mural Project! Thanks to Elliot Stoller, and all those featured, for creating this video! Check out more of his videos on Vimeo. 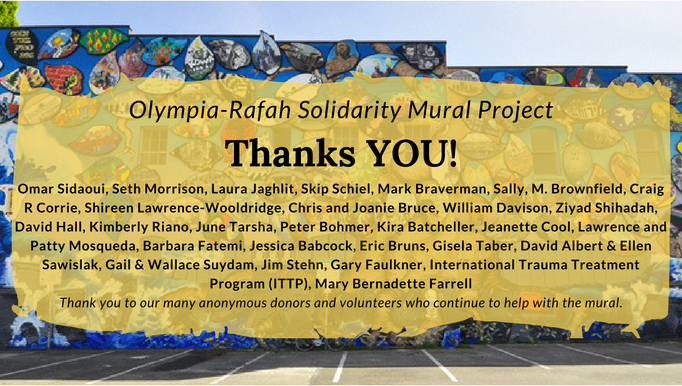 After 10 years of Olympia winters, the Olympia-Rafah Solidarity Mural Project needs repairs. In September 2017, we were able to put together a great team to inspect the wall, reinforce the leaves and seal it. On October 11th, we reached our $6,000 goal and were able to fundraise a bit towards our stretch goal is $13,150 to fund solar lights for the mural and adjacent parking lot, increased electricity for events, and hosting the Third Annual Social Justice Bloc Party in Spring 2018. If you’d like to contribute to any of these items, click the “Donate Now” Button below and select “ORSMP” in the pull-down menu. Thank you to all who donated towards the sustainability of this project! The olive tree before leaves were added. The Olympia-Rafah Solidarity Mural Project (ORSMP), a project of the Rachel Corrie Foundation for Peace and Justice and the Art Forces Media & Arts Project was started in 2006 and completed and dedicated in 2011. It is the result of a collaborative effort of more than 150 groups and individuals–from the local to the global, from Olympia, Washington to the Americas, from Europe and Asia to Rafah, Palestine. This multi-media project builds relationships across movements, issues, cultures, and great distances. It honors those who have lost their lives striving for liberation and seeks to strengthen and make more visible the efforts of some of the many organizations and individuals who work for justice and dare to imagine a different world. Progress being made on the mural leaf installations. The mural is located in Olympia, Washington, the hometown of Rachel Corrie, who was crushed to death by an Israeli bulldozer while defending the home of a Palestinian family in Gaza and tells a tale of two cities, Olympia and Rafah, linked through tragedy and resilience. It is the tale of people coming together across a wide range of borders, using advancements in technology to bridge physical and financial distance and to include the artwork of Palestinians, who are forbidden to travel. The mural depicts a large olive tree filled with 119 leaves of organizations from around the world, and a symbolic wave breaking the Israeli Separation Barrier. Click here to view each leaf from the tree, and the organization that created it. Every spring and fall, RCF hosts events at the ORSMP during Olympia Arts Walk. Olympia has become known for its many murals. 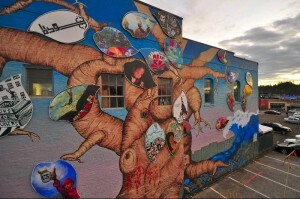 Now, the City of Olympia’s Parks, Art, and Recreation Department has created a collection of murals in Downtown Olympia and the ORSMP is featured! Check it out below. For more information about the ORSMP visit http://olympiarafahmural.org/ or http://artforces.org/. 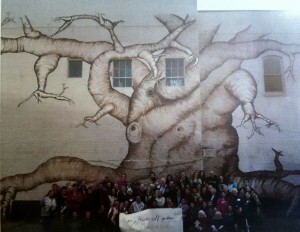 Viewers can use a phone to call and hear the mural come to life! Dial +1(360) 252-9779. Use the link below to download the audio key and to access information about leaves on the mural.